One of my great finds on Twitter last year is Julie Warner, who Tweets and blogs for Warners' Stellian Appliances in Minneapolis/ St. Paul. Julie's as engaging as she is informative, she really knows her stuff. Warners' Stellian Appliances has been a family owned and run business since the 1950s. In an era when independent retailers are disappearing, Warners' Stellian proves that through a commitment to community and customer alike, it's still possible to thrive. Intelligence and hard work don't hurt either. Not in the Twin Cities? Have no fear, Warners' Stellian handles online sales through their website. Check them out. Julie writes the Warners' Stellian blog and it's always full of terrific ideas and pointers. Such was the case earlier this week when she wrote the following about refrigerator maintenance. I asked her if I could reprint it and she agreed graciously. You might not have spent 13 grand-something on a fridge, but I’m sure you plunked down a good amount. Here are some maintenance tips to help get your return on that investment. See my previous post, Ice maker troubleshooting. You can find Julie on Twitter as @WarnersStellian, you can also find their fan page on Facebook. In addition to that, here's the link to their website and of course Julie's terrific blog. Thanks Julie! So gang, chime in. Anybody have a refrigerator hint they're dying to pass along? I just attacked mine last weekend. I live alone and I'm forever stunned by the number of condiments and pickled vegetables I can accumulate in a short period of time. I have the same problem. And I buy a lot of things on a whim. "Oh, capers, I totally need those!" So I have some things that I'm not even sure what I'm going to do with them, taking up space! 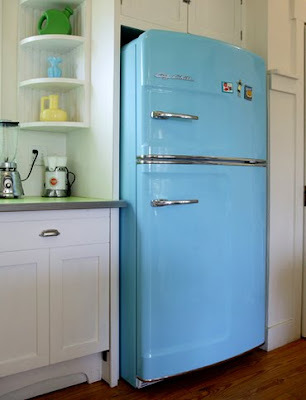 May I add the following tip re Fridges? Prior to purchase, 'test drive it first'. Last year, my dearly beloved Fridge of fifteen years was replaced with a new model which I absolutely detest! Reason, when I go to retrieve something from it, it is not uncommon for me to bump my head. (I mean really bump my head as I have had the occasion to actually 'see stars'.) I am not what you consider 'a giant' but due to its design, it is literally a hazard to my health. BUYER BEWARE! Just how does one test drive a refrigerator prior to purchasing one? Short of spending a lot of quality time on an appliance showroom floor, I don't know how you could know that sort of thing prior to purchasing one. Good idea though. Excellent! We're talking about the same thing more or less. I thought that maybe you had some kind of a deal with a manufacturer and they let you try out a model or two in your home before you committed. I was all ready to start screaming "No Fair!" Mercifully I kept my mouth shut. Hah!